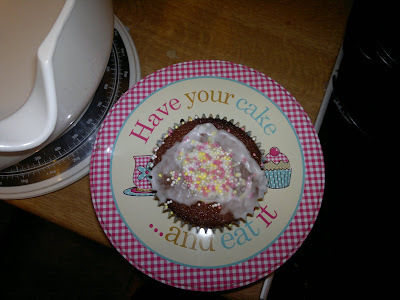 the kids made these with NO adult help with exception to the oven, I put them in the oven, Darn they taste yummy! Fabulous!!! Loving the plate too!! hehe Clever kids! Yummy, cake quite possibly is my favourite thing in the whole world!! Sorry, It's not a plate, it's a cake tin wifies sister got us. This was there first outing. Those look mighty good for made without adult help efforts.